The enhanced infrared performance of a new modified Gallium Lanthium Sulphide (GLS) chalcogenide glass family is illustrated in this transmission curve. Details of the modification and the range transmission achieved are in Dan Hewak’s latest presentation. 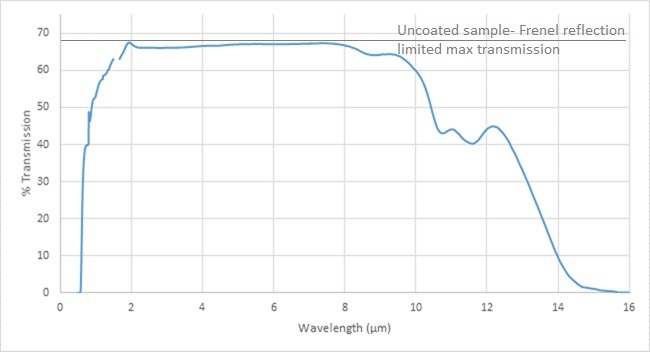 The strong bonding and high glass transition temperature that characterise GLS glasses are maintained in this formulation and are anticipated to yield the enhanced mechanical, thermal and chemical durability seen in previous GLS glasses relative to other chalcogenide glasses. Further improvement of the loss in the infrared band and extended characterisation is anticipated in the coming months. We will shortly publish refractive index data on the GLSe glasses. Based on the composition we expect the index to be slightly higher than regular GLS ( n-2.31 at 5 microns). At these index figures the double Fresnel reflection from both sides of an uncoated glass plate at normal incidence is ~30% as indicated in transmission plot. Correct coating would remove this reflection.